I can't believe its taken me this long to finally try Alma. I was finally inspired by the restaurant's decision to 86 the a la carte menu and replace it with a tantalizing "longer tasting menu" to go along with its existing 5-course menu. 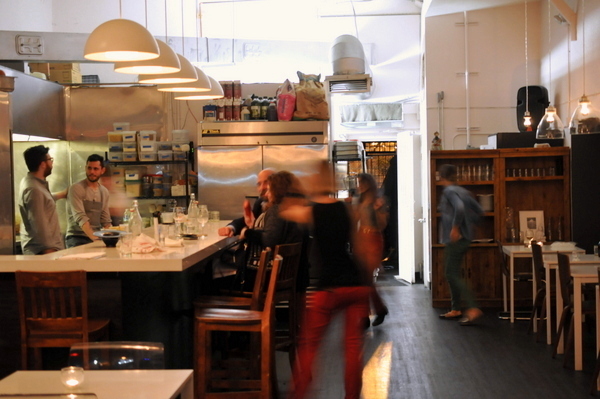 The brainchild of 26-year old wunderkind Ari Taymor, Alma began life as a pop-up in February 2012 moving from Venice to Silver Lake before finally settling in a former Kabob joint Downtown. Arguably the hottest restaurant in the city right now, Alma has gained a cult-like following from LA's food Cognoscenti and was even lauded as "The Best New Restaurant in America" by Bon Appetit. As the story goes, the Palo Alto native dedicated his life to the cooking gods after a leg of lamb at Chez Panisse in 2007 and since then he's begged his way into kitchens throughout the Bay Area with notable stints at Flour + Water and Bar Tartine. In between his stateside jobs, Taymor spent some time at La Chassagnette a restaurant in Arles, France that had its own garden. This more than any other experience seems to have left its mark on the young chef, as evidenced not only in his style of cooking but also his decision to partner with a small farm in Venice run by Meadowwood alum Courtney Guerra to provide produce exclusively to Taymor's restaurant. Situated on a run down gum speckled street next to a hostess bar, Alma isn't exactly in the nicest of neighborhoods, but whats the risk of being shanked next to a good meal? 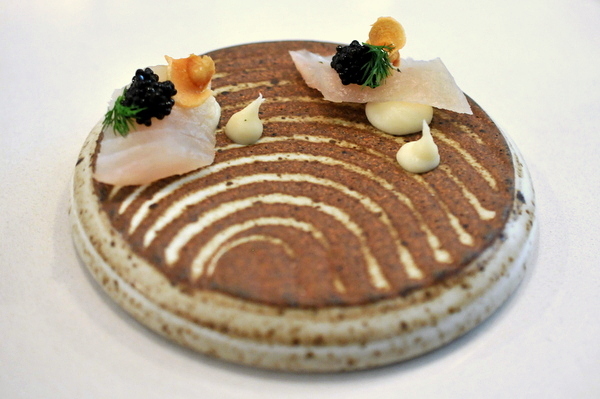 The first of the snacks was a wood soaked sturgeon, the dense fleshy fish is topped with a dollop of dark nutty caviar, a potent combination that is deftly contrasted by the bittersweet vegetal temper of the parsnip. This was my favorite of the three initial snacks. Reminiscent of a classic caviar presentation, the blini-sized muffin has the classically buttery flavor coupled with a mild creaminess from the burrata. 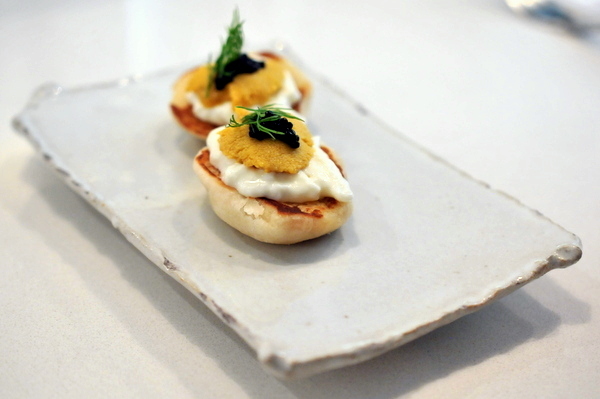 The creamy sweet duet highlights the briny smack from the uni and caviar topping. One of chef Traynor's signature snacks, the beignets were blunter than I was expecting with a thick doughy interior more akin to bread than tofu. I would have liked a bit more emphasis from the yuzu kocho. 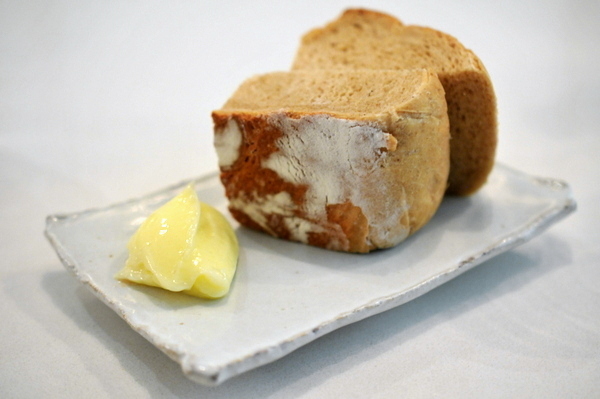 Though the course is called a consommé, the "soup" is actually made from crumbled chicken skin. The crisp crumbles capture the soup's purity of flavor augmented with a charred fatty gusto. 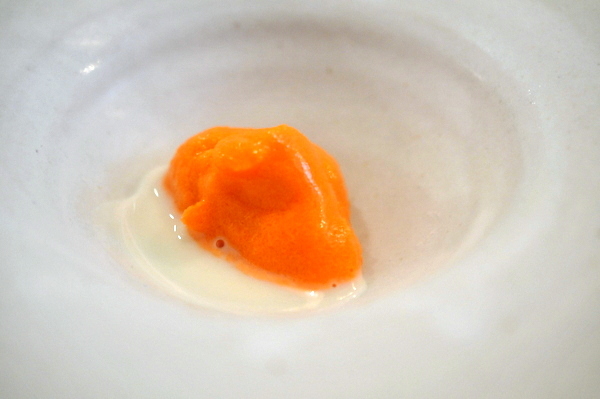 A dashi marinated trout roe brings a light brine kissed sweetness to temper the unabashed sapidity of the roasted chicken skin. The accompanying white Burgundy is brimming with vivid floral and ripe fruit notes, perhaps a bit round and one-dimensional but still quite enjoyable. Even before tucking into the course I was struck by the profound aroma of an cool ocean breeze. Indeed the salad is alive with the sweet brine of crab and the sharp bitterness of the fresh chicory greens. 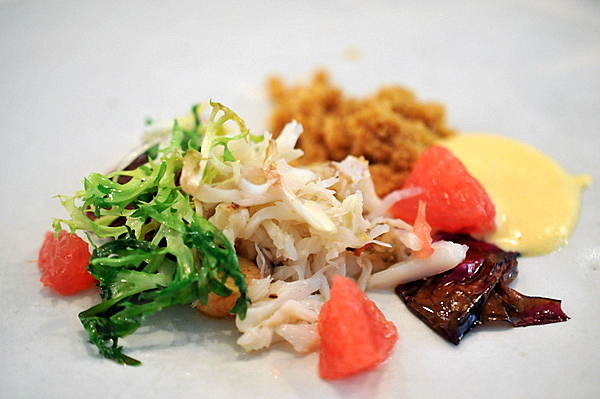 A rich aioli and breadcrumbs lend the course a countervailing richness and weight. This was another of the evening's standout courses. 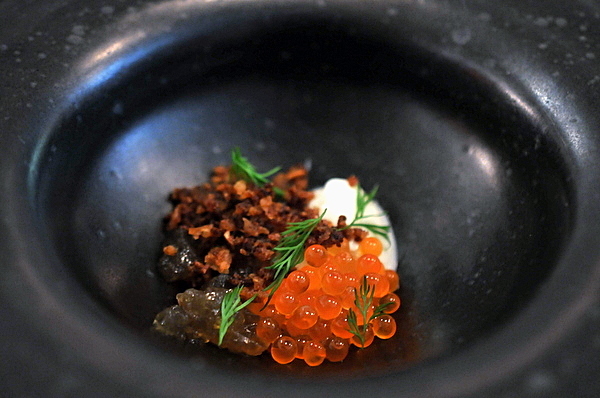 The duck liver is frozen in liquid nitrogen and broken into large crumbles that reminded me of a savory dippin' dots. The flavor is initially sweet and creamy but a growing offal-y richness quickly makes its presence felt. The sugary granola adds depth and complexity to the flavor profile and despite being on the sweet side, the course doesn't feel particularly heavy. The accompanying wine was equally as memorable, a Slovenian orange wine, the Cotar has an oxidative feel along with dried stone fruit and a slick saline mineraltiy. This course lacked the finesse shown by most of the earlier courses. 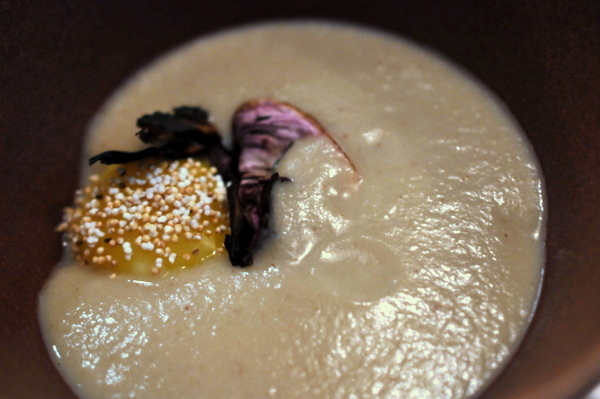 The sunchoke puree is sweet with a quirky smoky-sour twang on the finish. While the soup was enjoyable, I would have liked the egg to be more apparent rather than have it subsumed by the sunchoke. Similarly the date and amaranth were little more than quick flashes against the potent sunchoke. Round two of the surgeon was a much heartier affair than the initial snack course no surprise since cooked sturgeon tends to eat more like a cut of meat than fish. The sturgeon came with a translucent pink center and pleasing saline flavor that goes nicely with the starchy heft of the potato. 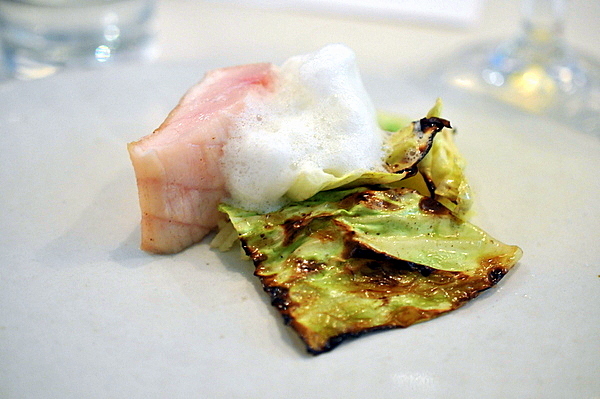 The woody zing of the pine and the charred verdant cabbage bring a superb layer of brazen dissonance to the fish. The final savory was an unholy amalgam of white and dark meat that has been sous vided then seared and conveyed a clear hauntingly pure note of roast chicken. Seasoning on the course was a touch off; the pressed chicken could have used a bit more salt while the small slice of sausage had almost too much flavor, bursting with a heady fatty salinity. 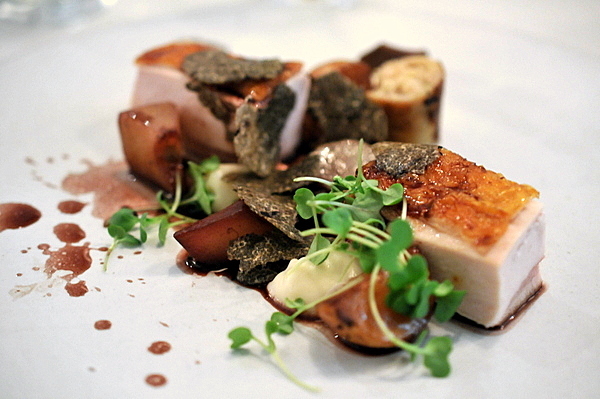 The fresh greens and bitter turnips provide a bitter, succulent counterpoint while the earthy musk of the shaved truffle harmonizes beautifully with the bird. The accompanying wine was a delicate Burgundian-style Pinot with bright sour cherry mixed with mint and earth. Though the menu doesn't include a cheese course the kitchen sent this out as a gift. Not sure exactly what kind of milk this cheese was made from but it was fairly mild and the shavings melted quickly on the tongue. The crumbles of truffle accented the Tomme's earthy mushroom-y notes while the honey adds a note of warm flowery sweetness that plays up the grassy elements in the cheese. The intermezzo was a cerebral mix of carrot and chamomile, the former was just on the verge of being cloying but the herbal flavor of the chamomile kept things in check. Our final dessert was built around a heavenly toasted oat ice cream, the toasty sweet flavor was surprisingly reminiscent of a black sesame ice cream with a touch of malty savor thrown in. 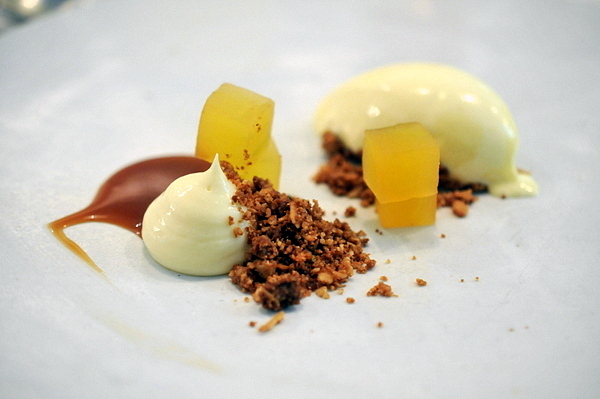 The thyme adds a lovely aromatic component that balances the weighty sweetness of the caramel. 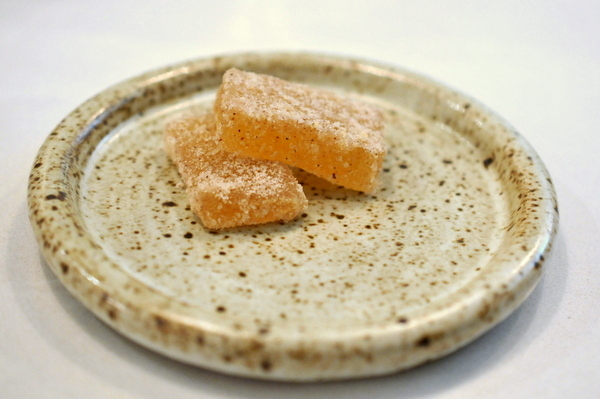 The apple gelatin has an unexpectedly pure note of fresh apple at once sweet and tart. The accompanying wine from the northern tip of Corsica was a rich syrupy elixir of nuts and raisin. The hazelnut sugar is readily apparent to start with a nuanced flavor of ripened fruit that was hard to identify specifically as apple. 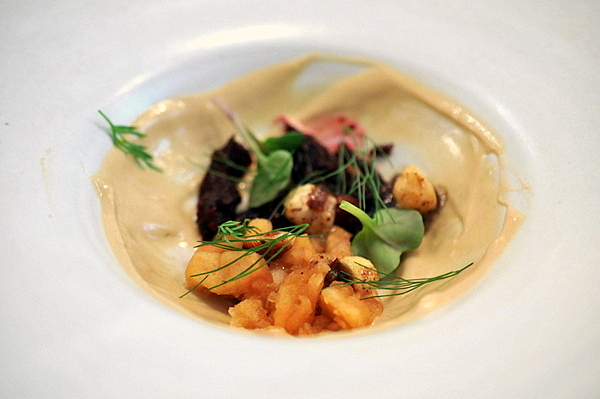 Some of the reviews of Alma describe it as the forebearer of LA's next culinary revolution. 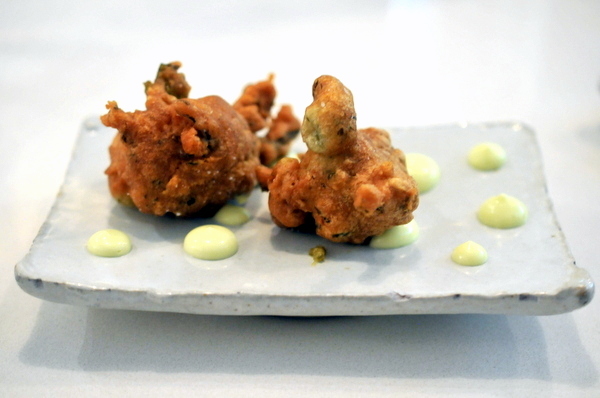 While I wouldn't go that far, it is hard not to appreciate what Chef Taymor is doing. 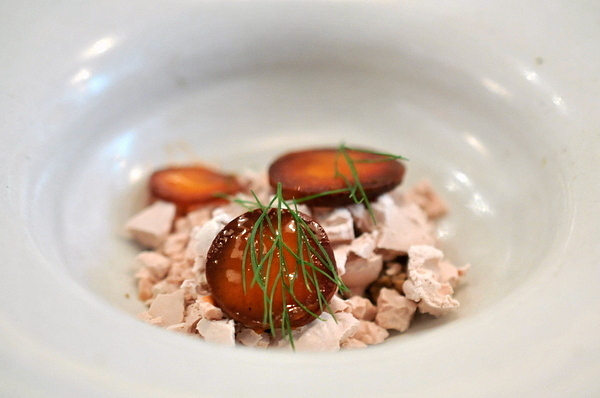 New American seems too prosaic a term to describe the food at Alma as such labels fail to capture the idiosyncrasies of Taymor's produce-driven style, the touches of modernist flair, or the Nor Cal aesthetic he brings to each dish. Indeed Alma neatly encapsulates the sum of Chef Taymor's experience and there isn't anything else in the city quite like it. man, i was so unimpressed by this place. 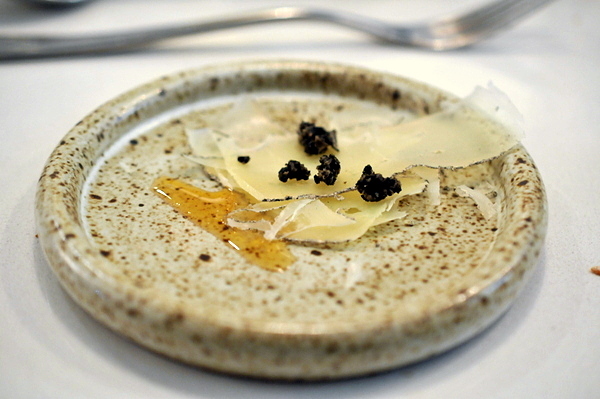 I went there three separate times, twice doing a tasting menu and once doing ala carte (but ordering everything on the menu) and I can't understand why this place was named the best new restaurant in 2013 by BA. The service is pretty awful. The food is terribly inconsistent. It's just a confusing thing to me. Alma is a really polarizing spot. While I don't give much credence to Yelp, I did find it interesting that the reviews are all over the place. 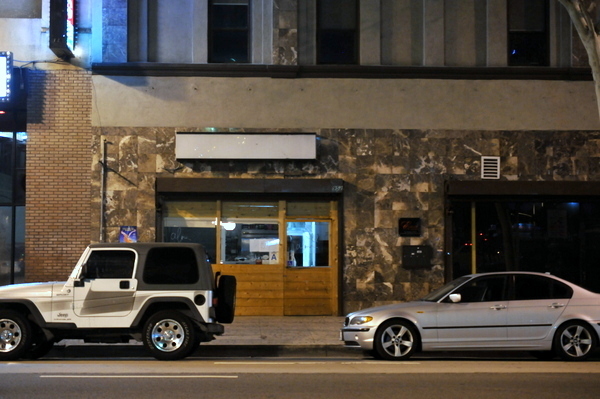 There are an unusually large number of 1 and 2 star ratings for such a highly touted restaurant. I agree with you about the BA rating. I thought the food was enjoyable though not outstanding in terms of pure flavor maybe the result of Taymor's focus on lighter flavors. As for service, I didn't have any problems during my meal. All but one wine pairing came before food. Staff explained all the courses in detail. How long ago did you go? Maybe things got better since you last went.